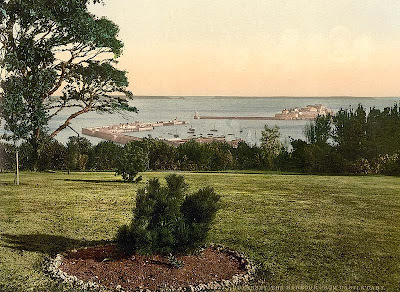 The story revolves around Juliet Ashton who discovers a charming group of people who formed the Literary and Potato Peel Society on the Channel Island of Guernsey during the German occupation in World War II. This group of people on Guernsey got through the occupation by reading and discussing a variety of books. There are some rather remarkable personalities within the literary society and Ms. Ashton finds herself so enamoured with the lot that she leaves her home in London and makes her way to Guernsey to meet and live among the society members for a time in order to learn more about them. Along the way she discovers what she wants in life and who she is. 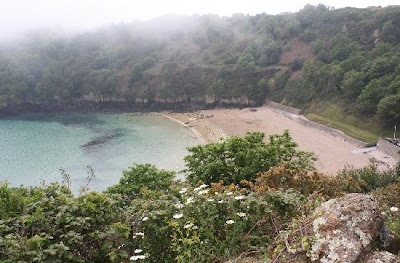 We meet a lovable cast of characters and have a wonderful time on Guernsey. I, for one, did not realize that this was a historical fiction. I just thought it was contemporary fiction so I confess to hem and haw over it for that reason. Sure, it sounded clever (and entire book told through the writing of letters!?!) but, still, contemporary! Imagine my utter delight to open it up and find that it is set during my favorite period in history - World War II! Glee and delight! Furthermore, author Mary Ann Shaffer (who actually died before the book was completely readied for publishing) has a quick and shining wit that made reading this book a pleasant journey. At first it was a bit difficult to figure out who the characters were because the book is told through a series of letters, but it sorts itself out easily enough and within the first 20 pages or so you find the rhythm and it's hard to break away from it! I utterly loved this book. For me, it's a five star read. There is some foul language in it. I think I ran across three bad words and they are scattered throughout the book so you catch one at the beginning, one in the middle and one near the end. It's not too bad and I still loved the book enough to totally ignore those words. There is one character who has a questionable lifestyle but it's hard to pinpoint the facts of the matter because the author dances on by the issue so quickly you aren't sure exactly what she means by it. (I'll leave you guessing. You'll find out what I mean if you read the book.) In short, nothing was so blatant to turn me away. Everything was so witty and creative to draw me in and keep me enthralled from page one all the way to page two hundred and seventy four. All the while I was reading I was desperately hoping for a sequel so I was a bit disappointed to pick up on the fact (AFTER I was done reading the book!) that the author (unfortunately) died before completing a rewrite of the book. Her niece, Annie Barrows completed the work on the book but you cannot tell at all that it has two authors. The book is written in one voice and oh how that voice put a smile on my face. I really just want to say: "I LOVED THIS BOOK! READ THIS BOOK!" because it offered up so much FUN to me. Don't make me TALK about it, just let me SIGH about it! 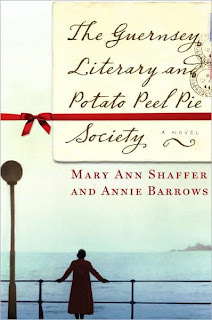 I look forward to many rereads of The Guernsey Literary and Potato Peel Pie Society in the future. It's a keeper and a winner to me! 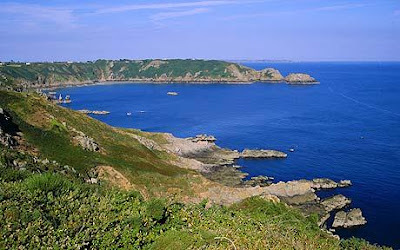 To learn more about Guernsey, you can get a brief over of The History of Guernsey here. great review. I loved the book too. I have recommended it to many and they all loved it too. I just knew you would love this book! I would love a sequel, too. Maybe the sheer popularity of this one will spur her niece to write one. I'm SO glad you put those pics in-- they're just what I needed to complete this reading experience!! I feel the same way, I am careful to get the name right now that I've read it. The name has more meaning of course. Thanks for the pictures, too. I wouldn't call it a 5 star read, probably only 4, but I did enjoy it. Here's my link since it's been so long since everyone else posted up. My MIL suggested this book to me years ago. I just recently found it in the free little library across the street. I too am "behind the times", but glad to have read it as I enjoyed it very much. I, too, am "behind the times". My MIL suggested this book to me years ago. I just recently found it in the free little library across the street and snatched it up. I'm glad to have read it as I very much enjoyed it.